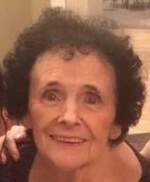 Elaine T. Marchegiani, born July 30, 1935, a lifelong resident of Jessup, died unexpectedly Saturday, July 28, 2018, at Moses Taylor Hospital. She was the widow of Eugene Marchegiani, who passed away in 1986. Born in Jessup, she was the daughter of the late Stanford and Elizabeth Gaughan Conniff. Elaine was a graduate of Jessup High School class of 1952 (proudly voted class’ best nails). After graduation, she went on to work as a secretary in the Empire State Building. Prior to retirement, she worked as a certified private nurse’s aide. She was a member of St. James Church and Queen of Angels Parish. She was the former president of the Altar and Rosary Society at St. James Church. Elaine was a devoted Catholic, loving mother, friend and grandmother. She always knew how to make people laugh with her humor. Her funny wit and sense of humor will never be forgotten. Mom never forgot anyone’s birthday. We all waited for her to sing happy birthday to us, and she always did. She overcame so many obstacles but came shining through, like a bright star that will forever glow in the sky. Mom, it’s your time to rest, and know that we cherished every moment, every laughter. You’ll live on forever because of the memories you created with so many. Gone to heaven but forever in our hearts, where you’ll eternally live. Surviving are daughters, Jenene Walter and husband, Mark, Peckville; and Brenda Shorten, Jessup, and fiancé, Robert Mason; sons, Dr. Gene Marchegiani Jr., Peckville, and Bruce Marchegiani and wife Monica, Jessup; grandchildren, Serene, Jessie, Krista, DJ, Bryce, Brandan, Amanda, Sarah, Bruce and Noelle; sisters, Betty Jean “Dee Dee” Schultz and Janie Healey; a brother, Stanford “Buddy” Conniff. ; several nieces and nephews. She was also preceded in death by a brother, Daniel Conniff. The funeral will be conducted Friday at noon from the Arthur A. Albini Funeral Home, 1003 Church St., Jessup, with Mass of Christian Burial at 1 p.m. in Queen of Angels Parish in St. Michael’s Church, First Avenue, Jessup. Interment St. John’s Cemetery. Friends and family may call Thursday from 5 to 8 p.m.
To send flowers to the family of Elaine T. Marchegiani, please visit our Heartfelt Sympathies Store.